The Archangels Gabriel, Uriel, Raphael, and Mikael were said to be endowed with a portion of Gods power. Dragão de San Miguel. Portugal. The pan-European tradition of St. Michael traces back to the time of the pagan conversion to Christianity...The association with pre-Christian relics and monuments suggests that before this time, the character of 'St. Michael' existed in a different form, and was connected to events in the solar calendar. It is said in the Bible that the name Michael (Mi-ka-el), originated when Lucifer (the fallen angel), compared himself with God, another angel stood before him and shouted "Who is like God? ", which in Hebrew translates as 'Mi-ka-el', after which he became known as Michael. In the 'Apocalypse' by the apostle John, it was written that a dragon with seven crowned heads and horns, and a tail that swept aside the stars, threatened the virgin Mary and her newly born child. St. Michael and his angels fought the serpent from Satan and destroyed it. (2) Apep, the Seven-Headed Dragon of Egypt has been identified with Tiamat, the Great Dragon of Sumeria, slain by Marduk. This primordial goddess is also the prototype of the biblical monster Leviathan. In France, it is said that St. Michael fought the devil (Satan, Lucifer) on Mont Dol in Brittany - which is part of an alignment with Mont St. Michel and d'Avranches. 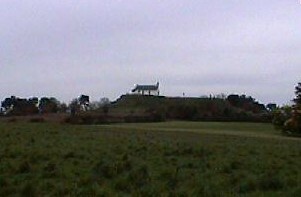 In England, tradition places the battle on Dragon Hill. The spring festival of St. Michael is on the 8th May. Mont. St. Michel (Brittany/Normandy Border) - Mont St. Michel is an island granite outcrop, which was known as Mont Tombe until the first Monastic settlement in 708 AD, built following the appearance of St. Michael to the bishop of Avranches. The main church at Mont. St. Michel is orientated at 26° north of true east (The same as at Notre Dame). This orientation can be extended in both directions to form an alignment with Mont Dol to the south-west, and Avranches to the north-east. Mont Dol is the place where St. Michel is said to have fought Lucifer. On the 8th of May (the spring festival of St. Michel), the sun rises over Avranches towards Mont St. Michel, then Dol-de-Breton. Article: Der Spiegel. Feb. 9th. 2011. 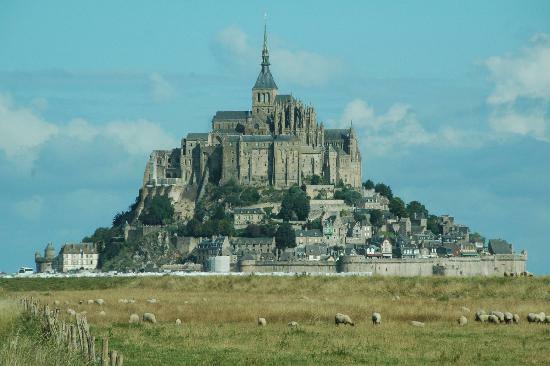 Mont St. Michel World Heritage Status Under Threat. 'The French island abbey of Mont-Saint-Michel is at risk of losing its World Heritage Status because of plans to build wind turbines that could blight the spectacular view. Campaigners are up in arms, but French President Nicolas Sarkozy is determined to turn France into a world leader in wind power'. This is probably the most famous ley-line in the world. It runs across England from the tip of Cornwall to the Eastern tip of Norfolk on the Norfolk/Suffolk border, passing through the prehistoric sites of The Hurlers, Glastonbury Tor (St. Michaels church), Avebury, Waulads Bank and numerous other significant sites either named after St. Michael or St. George, both dragon slaying saints. The line follows the path of the sun on the 8th of May (The spring festival of St. Michel) on an azimuth of around 242° (28° north of east). This day was celebrated in past times as 'Beltane', the beginning of summer, and a cross-quarter day, marking the midpoint in the Sun's progress between the spring equinox and summer solstice. 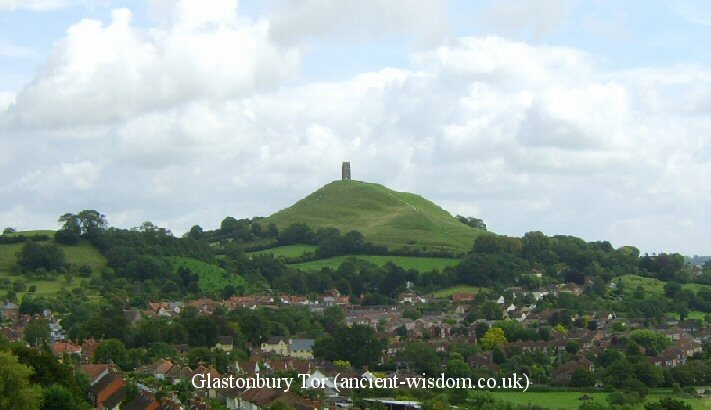 Both Glastonbury Tor and "The Mump" at Burrowbridge some ten miles to the south-west appear to have been artificially shaped so that their axis align with each other, with an orientation, 27° north of east. The biggest divergence from this orientation lies in the first/last section from The Hurlers Stone circle to St Michael's Mount, which is much closer to 238° (32° north of east). 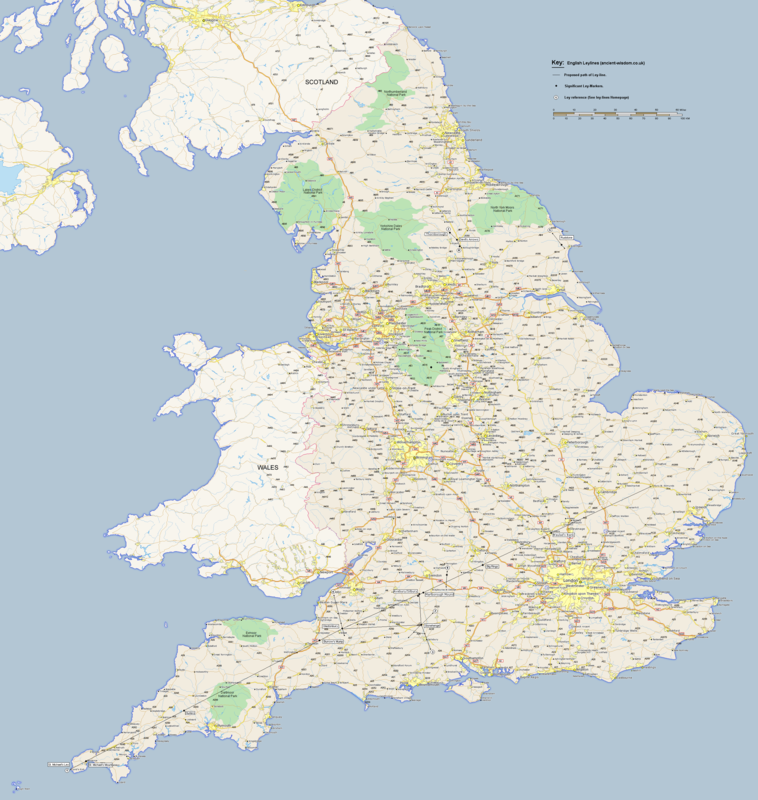 It is therefore appropriate that the St. Michael''s ley has been called a 'corridor of incidence' rather than a 'ley-line' as some of the locations along the alignment are not exactly aligned. Hamish Miller suggested that the line was actually two lines, one entwining the other, he called the second line the St. Mary's line due to the number of sites dedicated to her. In addition to the more famous prehistoric landmarks of Glastonbury and Avebury, the St. Michael's ley passes over several significant hilltop shrines dedicated to St. Michael. 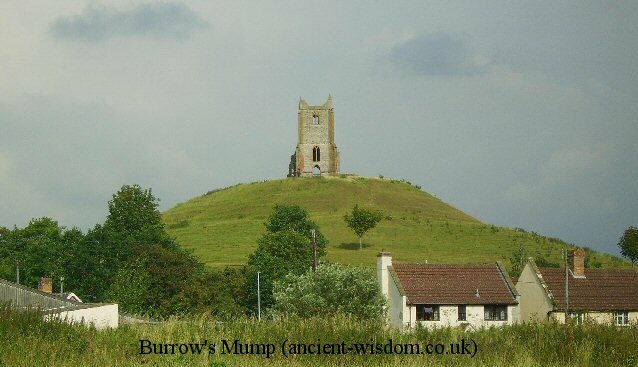 These include the larger than life conical 'Barrow mump' (Burrow's mump, Burrowbridge mump), ten miles to the west of Glastonbury, St. Michael's Church at Clifton Hampden, and on Brent Tor, all of which have ruinous St. Michael's churches on their summits. Orion and the St. Michael's Ley, England. It is noticeable that the Hurlers triple circle were oriented towards Orion when they were built, they are also roughly orientated along the axis of the St. Michaels Ley. Curiously enough, another prehistoric site that sits on the St Michael's Ley also has a relationship to Orion; The Dorchester 'Big-rings' are the remains of a Henge (and Cursus) with similar dimensions as the Stonehenge bank and ditches (366 MY Circumference). In Yorkshire, the Thornborough Henges were built with double the circumference to the Big Rings and were orientated towards Orion. Some of the Better Known Locations along the St. Michael's Leyline. St Michael's Mount, Cornwall, England. 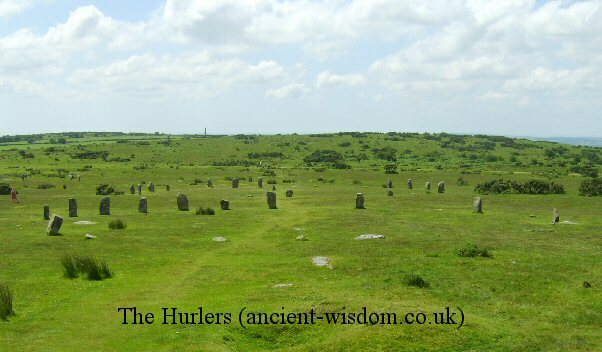 The Hurlers triple Stone Circle. St. Michael's Church, Glastonbury Tor. (Aligned with the St. Michael's Ley). 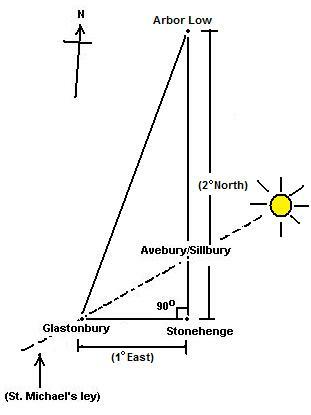 The pilgrims path leads north-east away from Glastonbury in the direction of Avebury/Silbury. A significant Neolithic barrow dated to 3,000+ B.C. The barrow is aligned approximately to the orientation of the St. Michael alignment with a north-eastern entrance pointing to Avebury. The remains of a 'sacred' pathway (The Beckhampton Way) leads into Avebury from the south-west. 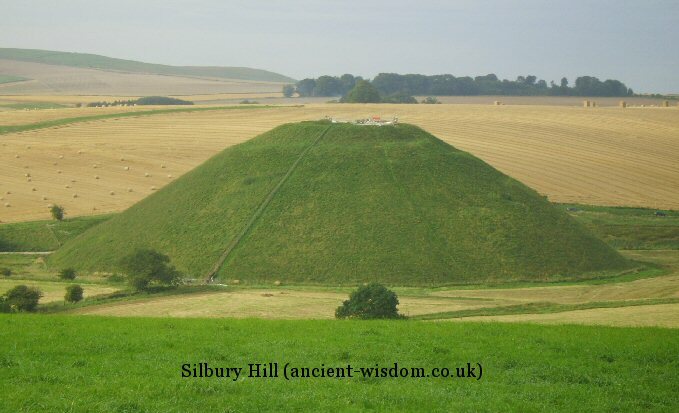 Silbury Hill. The largest man-made prehistoric structure in Europe. Avebury (The Largest Stone Circle in the world) is visible from Silbury Hill. The two can be viewed as components of a 'ceremonial' landscape which also include The Sanctuary and West-Kennet. The Big Ring Henge was part of a cluster of Neolithic sites located in the area. It had twin circle of ditches with the outer having a maximum diameter of just under 200 metres. There were two entrances broadly in the northwest and southeast, Sadly this site has now completely disappeared under a lake after gravel extraction in the area. This large Henge lies beside several natural springs at the source of the River Lea, and sits alongside the Iknield Way. It is a Neolithic D shaped enclosure consisting of a bank and external ditch of around 7 hectares with a turf reveted chalk & gravel bank (derived from the ditch material). The ditch is 9.2 m wide and 2.1m deep. In the late 1950's Jean Richer publicized the existence of a main axis of sacred sites in Greece through Delphi, Athens, Delos, Camiros, Prasaias [Apollo's Temple], the Temple of Artemis at Agra, Eleusis and other sites. The line links not only Temples and sanctuaries of the god Apollo but also sites earlier dedicated to the goddess Artemis / Diana. His brother Lucien followed this up in 1977 in an article entitled 'The Saint Michael and Apollo axis' in which he extended his brother's line north-west where it passes through the holy island of Skellig Michael on the south-western coast of Ireland, after crossing several of the most important sites in Europe dedicated to St. Michael, the archangel. 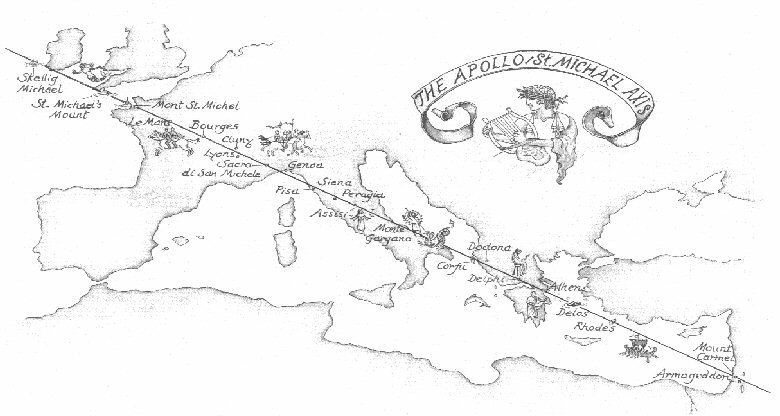 One legend recalls how Abaris, a druidic British priest of Apollo, travelled on the god's golden arrow from the British Isles to Greece to visit Pythagoras. ( Pythagoras is also said to have lived for a time on Mount Carmel in the Holy Land another site on this line). Another legend describes the return of Apollo from the land of The Hyperboreans to Delphi in a chariot drawn by swans. It can be seen from the map above that the European St. Michael's ley (Running across Europe from Skellig Michael in Ireland to Mt. 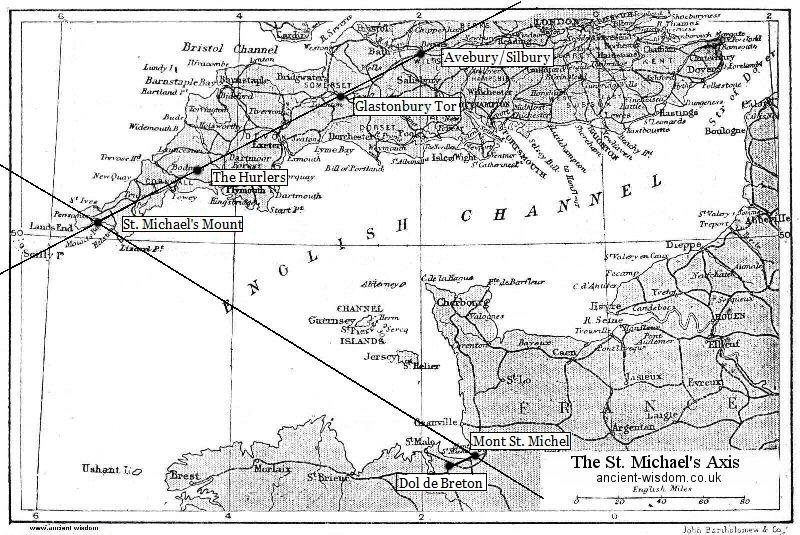 Carmel in Israel), crosses paths with two other St. Michael's alignments: The St. Michael's ley in England and the Mont St. Michel alignment in France (see below). The larger St. Michael's alignment that crosses Europe from Mont Carmel in Israel to Skellig Michael in Ireland, crosses two other St. Michael's alignments, both orientated at roughly the same angle (26° -28°), mirroring the larger alignment (along a north/south axis). It has already been noted that the St. Michael's ley in England does not follow an exact azimuth across the country, but meanders on occasion to include naturally high outcrops, a deviation of one or two degrees is to be expected, and this is exactly what we find here (perhaps better termed an 'Axis of Coincidence'). Both the French and the English leylines have clear signs of prehistoric activity along its path (such as the Hurlers, Glastonbury, Avebury, Waulad's Bank, Dol-de-Breton), and also ancient traditions of celebrating with fires on beacon-hills on may-day (St. Michael's day), all of which reinforce the idea of a 'functional' and operative alignment with prehistoric roots. Both alignments also include numerous churches and pilgrimage points dedicated to St. Michael (Apollo), that were 'reinforced' throughout the middle-ages by the church. One suspects that an ancient tradition has been passed on either knowingly or unsuspectingly during the Pagan/Christian conversion of Europe. The smaller French alignment is orientated along the same azimuth as the English St. Michael's leyline. The French alignment passes from Mont Dol (Where St. Michael is said to have fought the Devil), though Mont St. Michel to Avranches (The Diocese of the Bishop who envisioned St. Michael on Mont St. Michel). Both the alignment and the monastery he built are oriented on an azimuth of 26° north-east, the same as the axis of the Champs Elysee (Elysian Fields), in Paris. Skellig Michael, Ireland. - (from Sceilig Mhichíl in the Irish language, meaning Michael's rock), After being founded in the 7th century, for 600 years the island was a centre of monastic life for Irish Christian monks. The monastery comprises six intact clochans, two oratories, 31 early grave slabs, a monolithic cross and the 13th century church of St Michael. Sadly, and Ironically, the newly gained status from UNESCO is now in danger of being retracted through the over enthusiastic 'restorations' of the abbey. The Fabrication of History: Skellig Michael, Ireland. St Michael's Mount, Cornwall, England. - (50° 7' 6" N, 5° 28' 39" W) Centre of the English St. Michael's Axis. 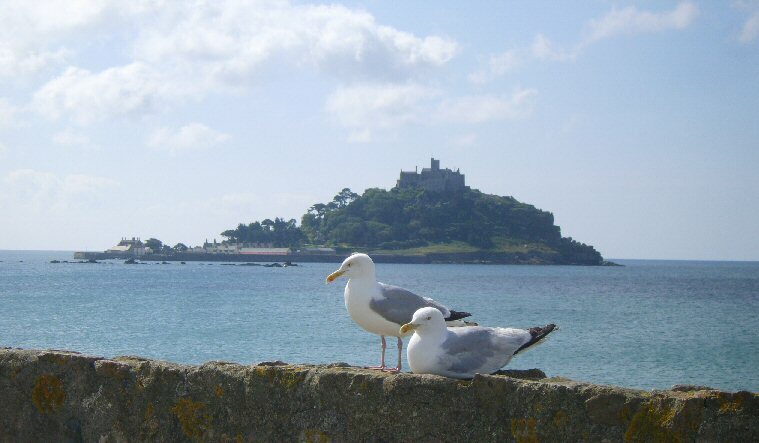 St. Michaels Mount, Cornwall was once named Dinsul, meaning Castle or citadel of the Sun. 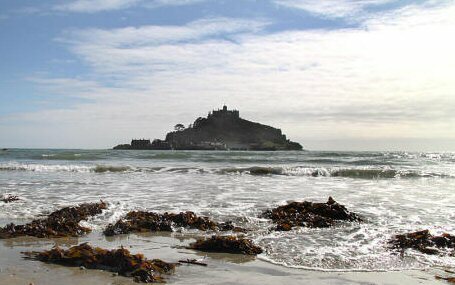 St. Michael's Mount still retains its Cornish name of 'Karrek Loos y'n Koos', meaning the 'Grey rock in the Woods' (a remarkable memory of more than 3,800 years, since the forest surrounding it has been submerged since at least 1,850 BC). 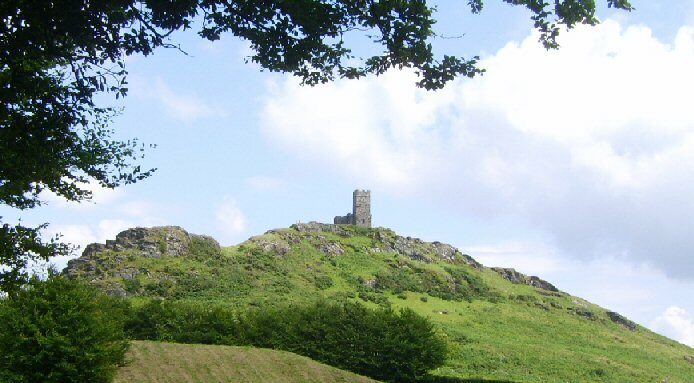 Legend says that a mythical giant named Cormoran once lived on the Mount, and he used to wade ashore and steal cows and sheep from the villagers to feed his gargantuan appetite. One night, a local boy called Jack rowed out to the island and dug a deep pit while the giant was asleep. As the sun rose, Jack blew a horn to wake the angry giant who staggered down from the summit and – blinded by the sunlight – fell into the pit and died. St. Michaels Mount, Cornwall, England with its strong similarity to Mont St. Michel, France. Before the construction of the first monastic establishment in the 8th century, the island was called "Monte Tombe". According to legend, the Archangel Michael appeared to St. Aubert, bishop of Avranches, in AD708 and instructed him to build a church on the rocky islet. Aubert repeatedly ignored the angel's instruction, until Michael burned a hole in the bishop's skull with his finger. Other Significant St. Michael's Locations. The St. Michael theme is also found in Portugal. The spectacularly located 'Anta do Tapadão' as well as having a superb 360 view, is located right beside a natural rock formation which has the clear appearance of a Dragon's head (right). The 'Tumulus of St. michael' is one of the seven great Tumulii of Carnac. 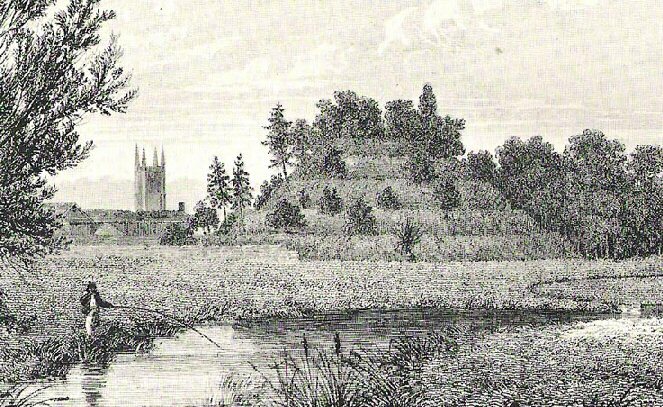 (known as Mané Lud, Ker Lud, Er Grah,, Mené Er Hroeuk, Tumiac, Le Moustier, and the Tumulus of St. Michel). 1). Alain Dag' Naud. Les Secrets Du Mont Saint-Michel. 1992. Editions Jean-Paul Gisserot. 3). Julian Cope. The Megalithic European. 2004. Element Books. 4). J. Michell; R. Heath. The lost science of Measuring the Earth. 2006. Adventures Unlimited. (Note: Previously called - The Measure of Albion). 5). The New View over Atlantis. 1983. Thames and Hudson.